On August 6, 1945, an US Army B-29 bomber dropped the first atomic bomb over an inhabited city. At 08:16 local time Hiroshima (広島市) disappeared from the map. Within a few seconds about 70 percent of the city, crucial to the Japanese war effort, were destroyed. The flammable wooden houses vanished in a firestorm. Only very few buildings in the city center remained, among them the A-Bomb Dome (原爆ドーム, gembaku dōmu), today’s peace monument. About 80.000 people (30 percent of the population) had been killed, among them almost all the medical staff. But the Japanese didn’t surrender just like that. The US had taken a neutral role in the Second World War until 1940, but the quick invasions of the German Reich in Poland, France and other countries suggested sooner or later it had to be prepared for war. While continuing to be neutral on the outside, the industry was switched to wartime economics, and the produced weapons were sent to already involved powers such as Britain, China, and the Soviet Union under the “Lend-Lease-Act”. By 1941, after the invasion of the German Reich into the Soviet Union and its declaration of war against the United States, it was finally clear that the own military could no longer be kept out of the ongoing battles. 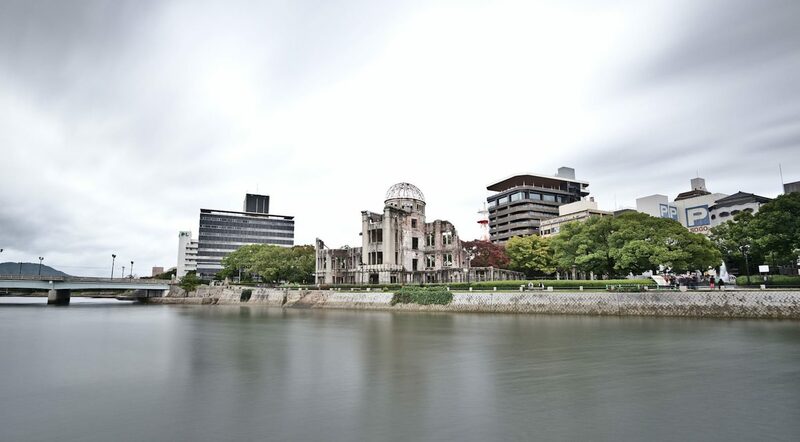 The Atomic Bomb Dome (原爆ドーム) in the middle of Hiroshima. Several scientists who had fled to the United States, including Albert Einstein, had sent a warning letter to President Franklin D. Roosevelt in 1939. They suspected the Germans could be working on a atomic bomb. However, at that time it was assumed that several tons of fissile material would be required, and none of the parties involved would have enough resources for such a program in the middle of an ongoing war. The US also assumed that it would not have to take care of Japan until the German Reich had already been defeated in Europe. In 1941, however, a British research group came to the conclusion that just a few kilograms of plutonium would suffice for a bomb, and in December of the same year the Japanese Empire attacked Pearl Harbor. Instead of defeating the Axis powers in distant lands, the Americans were slowly threatened with a war on their own soil. Roosevelt released the necessary funds, secret sites of the size of entire towns were built almost overnight. Tens of thousands of scientists and workers began the work on the first atomic bombs. The total cost back then was about two billion US dollars, equivalent to about 22 billion in today’s currency. 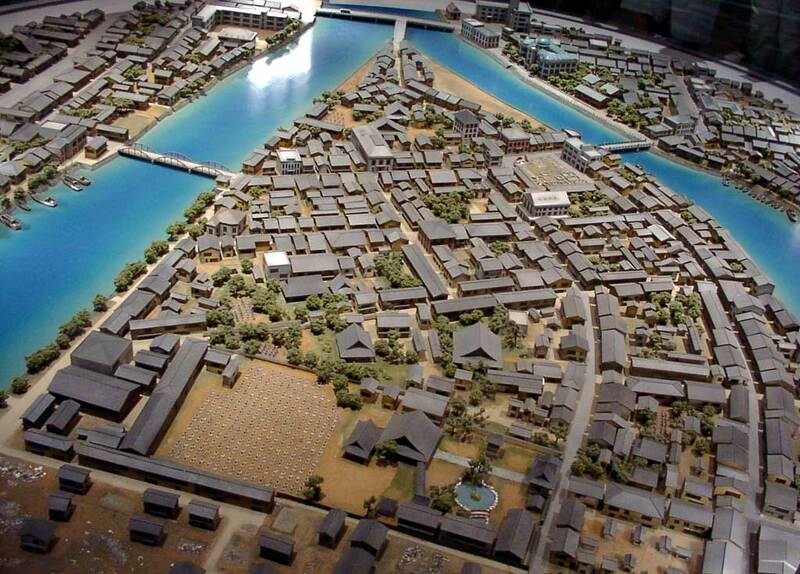 A model of Hiroshima before the attack, right above the later atomic bomb dome (turquoise). Copyright John Feather, licensed under the Creative Commons Attribution-Share Alike 2.5 Generic license. Italy had already capitulated and joined the Allies in 1943, the German Reich capitulated on May 8, 1945, but the Japanese Empire was hard to break. Defeat was unacceptable, and if it came to it they didn’t intend to just hand over their country to the Allies. Although the living conditions for the normal people were already catastrophic, they fought to the bitter end. Japanese soldiers were seldomly captured alive. Many of the Japanese cities, mostly made up of wooden buildings, had already been heavily destroyed by aerial bombardment. 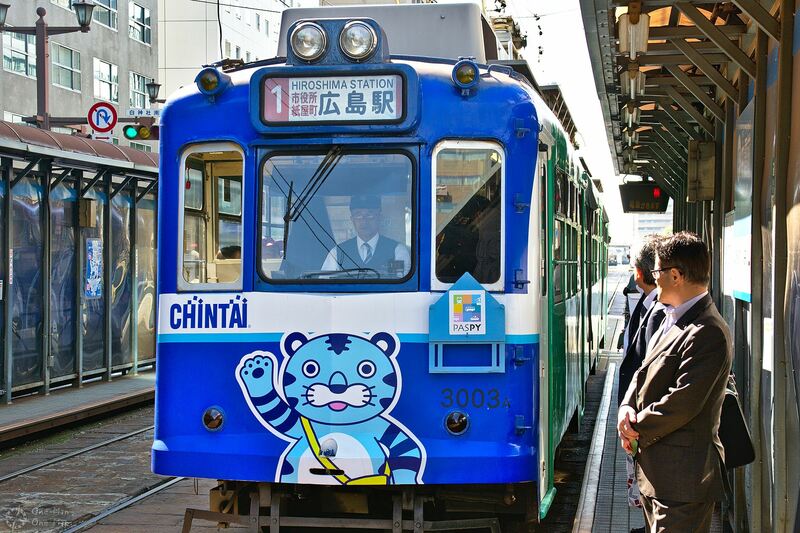 But some had been spared, including Kyoto and Hiroshima. 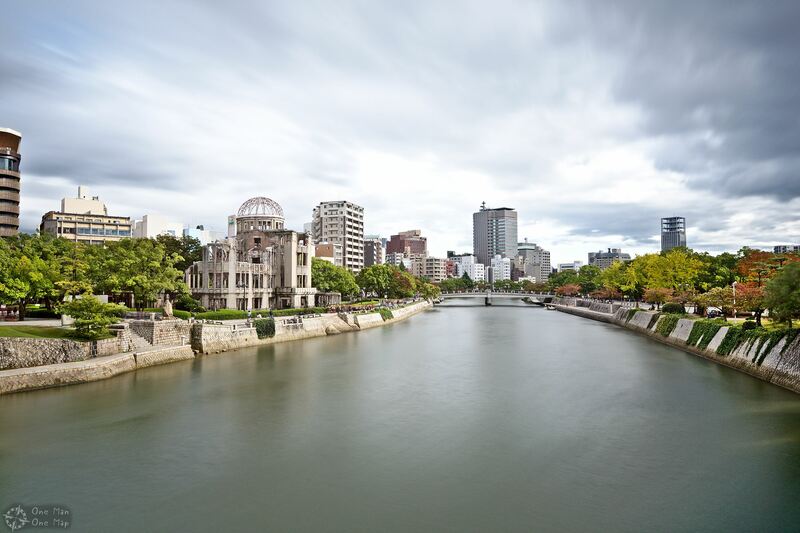 Kyoto is said to have been saved by Secretary of War Henry L. Stimson, who had visited the city on his honeymoon trip and knew about its cultural significance. 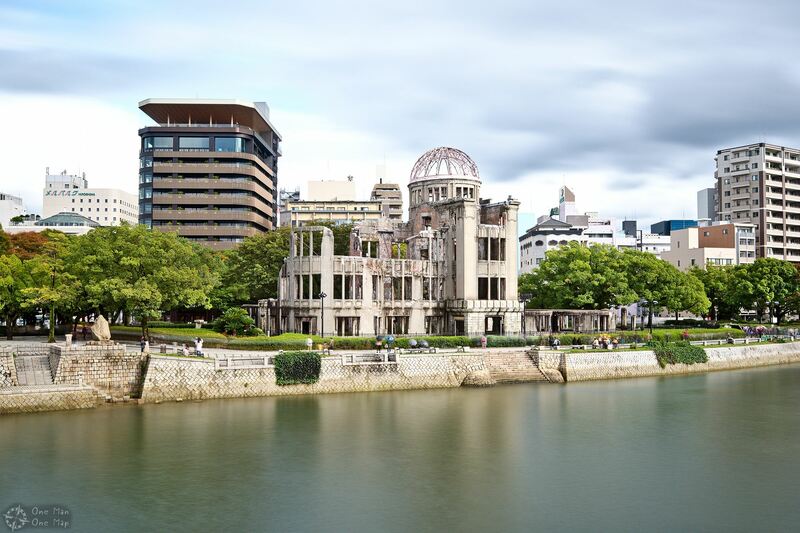 Hiroshima, on the other hand, was the military headquarters for the defense of Southern Japan and therefore equipped with strong defenses, but otherwise had no relevance to the Allies. It was a purely military target and also the only Japanese City without a prisoner of war camp. After a successful first test on July 16, 1945, the US military were the first armed forces in the world to have the atomic bomb. But this information hadn’t been leaked to the outside so far, even the test itself was covered up as an alleged explosion of an ammunition storage facility. Not everybody agreed on what to do next. One group argued for a non-military demonstration in the presence of the Japanese, another for a drop-off over Japan with an advance warning, a third for a surprise attack. The third option prevailed. The general public still likes to argue about which option would have been the best. The most important argument for a surprise attack was the assumption that the Japanese would probably not capitulate despite the bombing, but it would take weeks and months until atomic bombs were available in larger numbers. A non-military demonstration or a drop with an advance warning would therefore unnecessarily “waste” both the destructive and the psychological effects of one of the precious bombs. However, the discussion about potentially avoidable civilian casualties is more likely to be conducted abroad. In spite of the catastrophic conditions and the destroyed cities, there had been comparatively few war dead on the Japanese side, and the Allies expected very high losses during an invasion. The Japanese leader actually assumed that the Allies would not have a larger number of atomic bombs, and simply decided to endure the few attacks. From the Japanese point of view, the air raid on Tokyo on 9 and 10 March 1945 had already been more destructive than the bombing of Hiroshima. 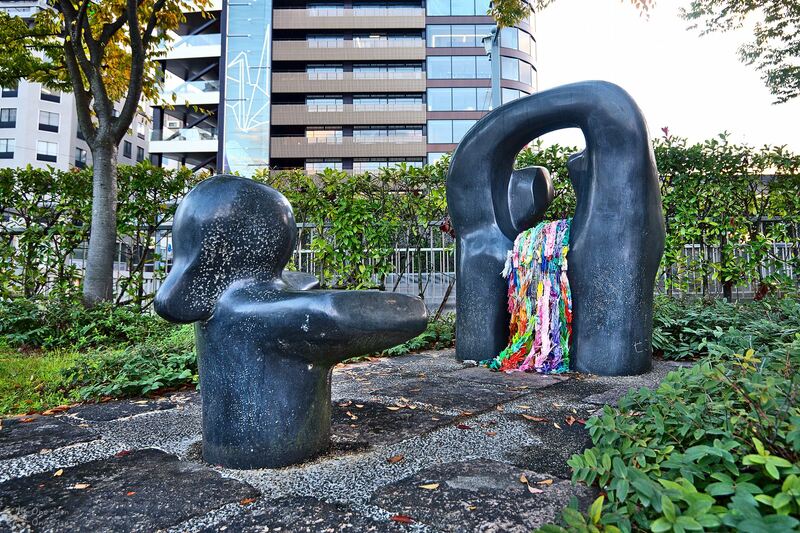 The best example for the Japanese attitude at that time is the story of Tsutomu Yamaguchi (山口 彊). 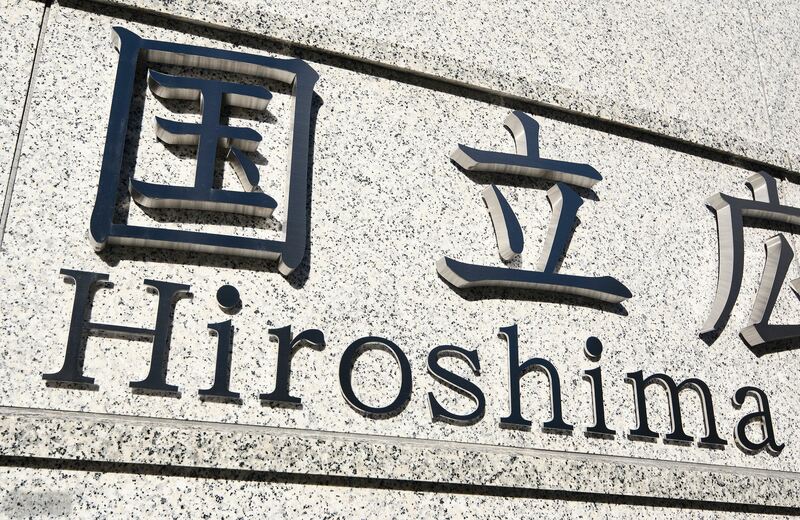 He was on a business trip in Hiroshima and only three kilometers from the hypocenter. Having suffered severe burns and a burst eardrum, he dragged himself back to Nagasaki, where he went back to work three days later. While he was still talking to his superiors about the atomic bomb, the second atomic bomb fell nearby. Miraculously, Yamaguchi was unharmed this time. He died of gastric cancer at the age of 93. Only the declaration of war by the Soviet Union and the dropping of the second atomic bomb on Nagasaki were finally enough to end the Second World War. The city was completely rebuilt after the war. 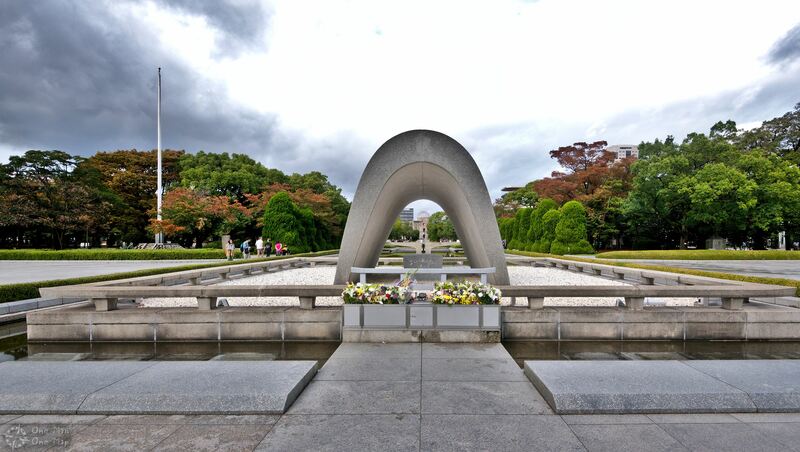 The Peace Memorial Park (広島平和記念公園) was built next to the A-Bomb Dome, where it also serves as a recreational area for the citizens. 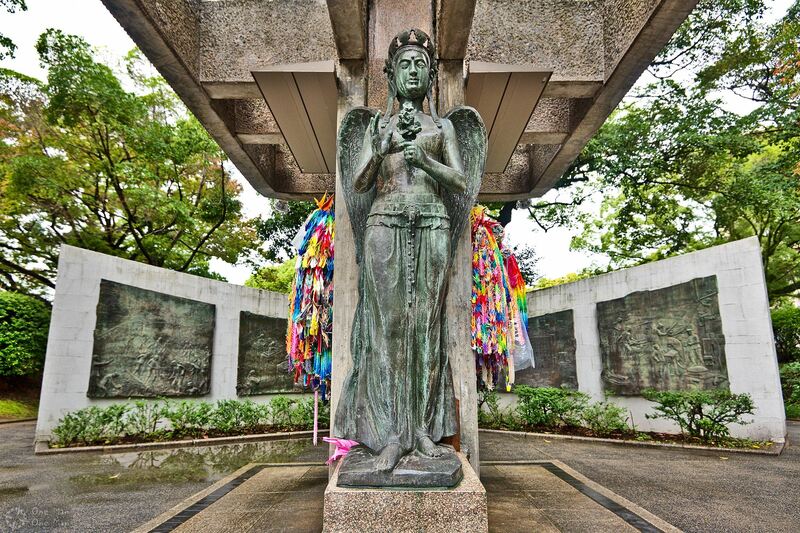 Colorful chains made of paper cranes, folded in memory of Sadako Sasaki (佐 々 木 禎 子) as a symbol of peace, were already visible from afar. Sadako developed Leukemia as a young girl in 1955 as a result of the radiation. 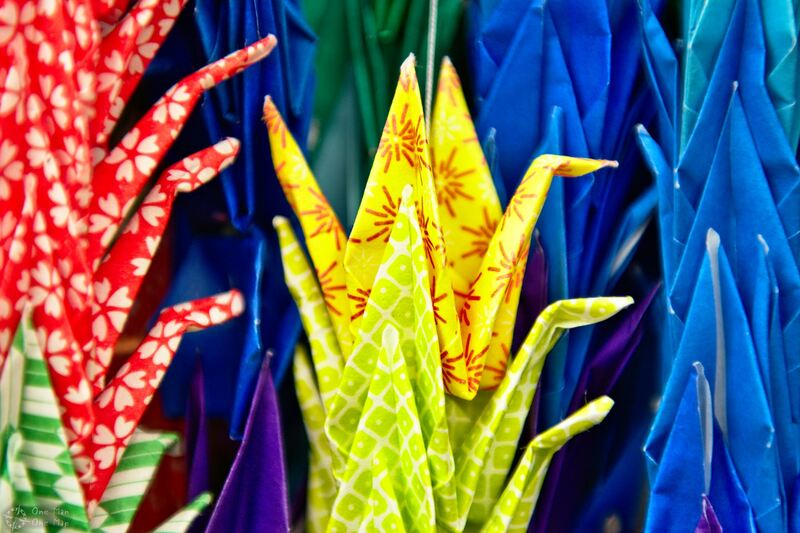 According to an ancient legend, the gods would grant a wish to anyone who folded 1,000 cranes. After she had completed the 1,000 cranes in less than a month and still did not get better, she kept folding. 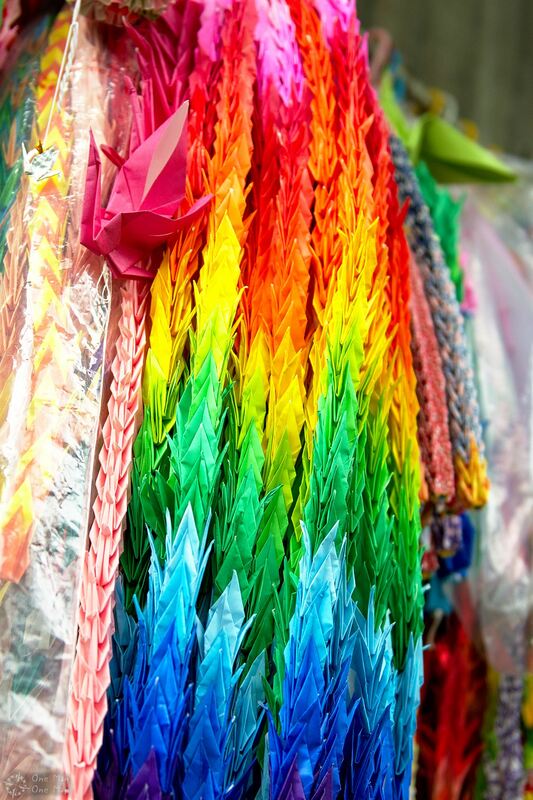 Sadako is said to have folded 1,600 cranes before her death. Today the chains are mostly being attached to the memorial tower for the mobilized and killed students, on both sides of peace goddess Kannon (観音). The Peace Flame represents two hands opening towards the sky like a goblet. 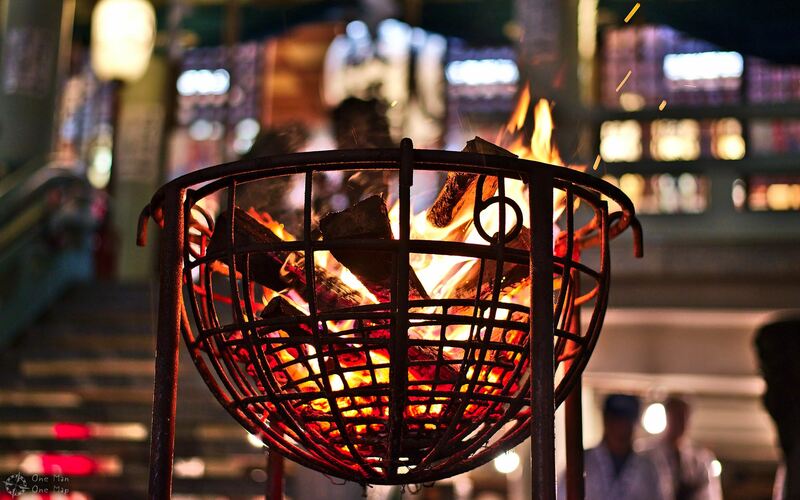 The eternal fire in the middle has been burning without interruption since 1964 and will burn until all nuclear weapons have disappeared from the planet. The Memorial Cenotaph (広島平和都市記念碑) and the Peace Museum (平和記念資料館) can be seen in the background. The Cenotaph, an empty tomb, contains a list of the victims of all nationalities updated to this day. There are currently about 270,000 names in almost one hundred volumes. 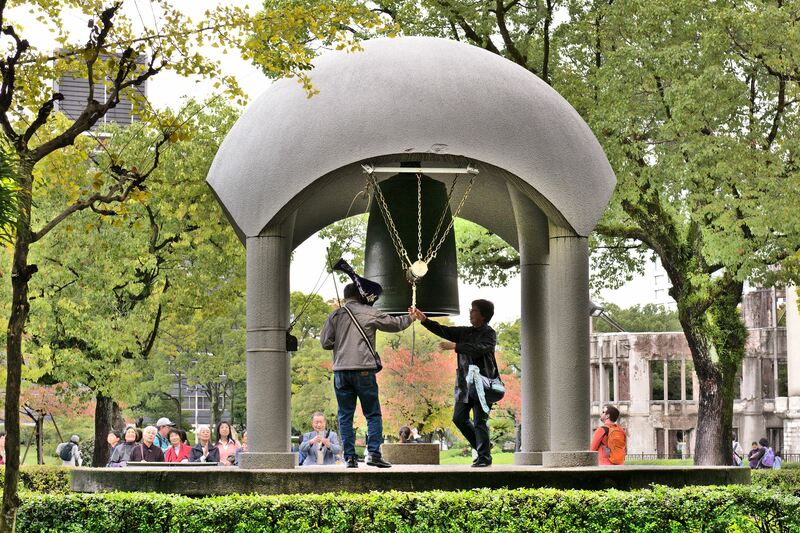 The park has three peace bells. The most famous one may be sounded by visitors, the loud tolling cound be heard again and again all day long. The surface shows a world without borders, the sweet spot is an atomic symbol. The Peace Museum has several Phoenix trees. These trees were almost completely hit by the pressure and heat waves and lost all branches and leaves, but some started growing again in the following year. 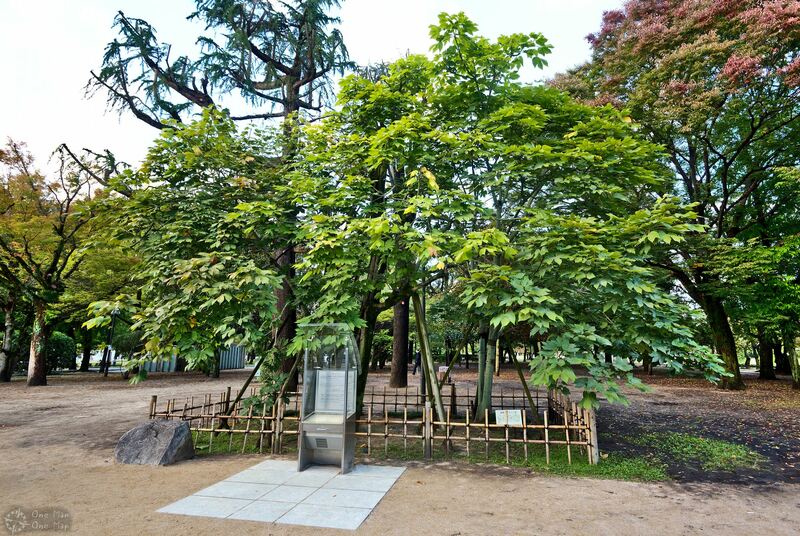 Although this was also the case with other trees which had been even closer to the hypocenter, this type of tree (Chinese Parasol) became a symbol of hope for the survivors. 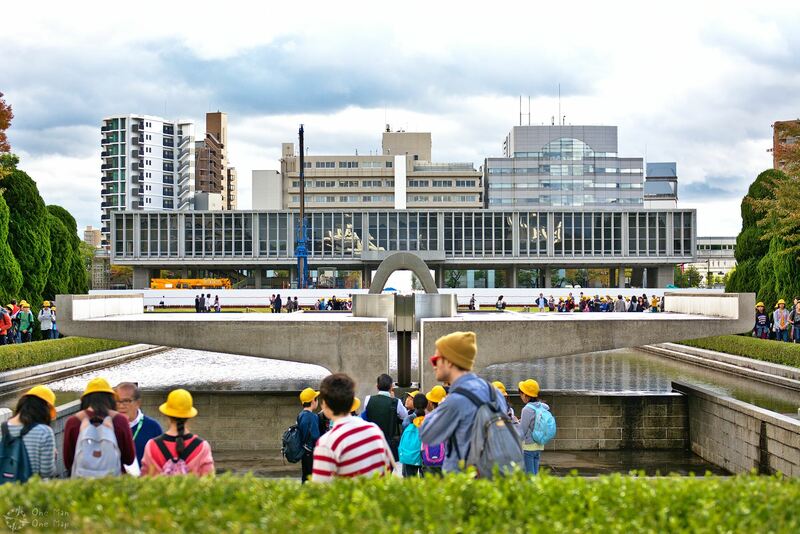 During my visit in late 2017, Hiroshima was a modern Japanese city like any other. 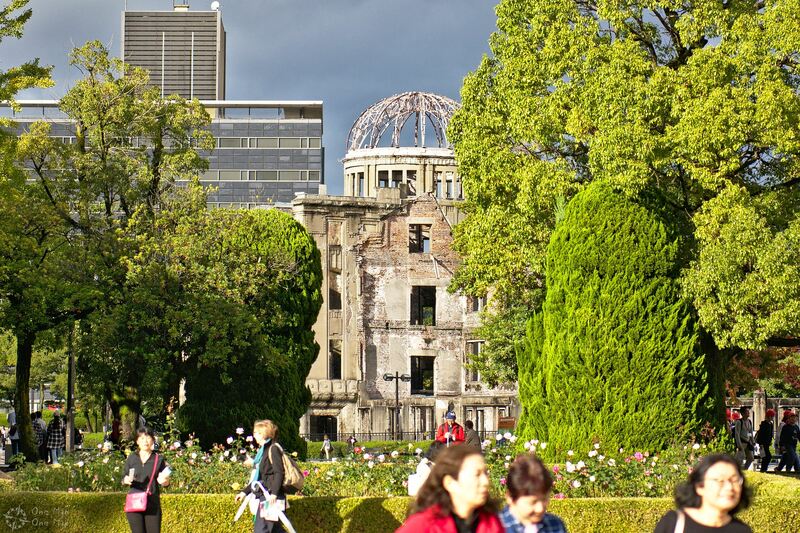 Sightseeing is mostly limited to the Peace Park and other atomic bomb monuments, though. If you are not interested in the zoo, the Hiroshima Castle rebuilt in 1958 with concrete (! ), or the Yamato Museum, it’s best to follow all the other tourists to Miyajima. 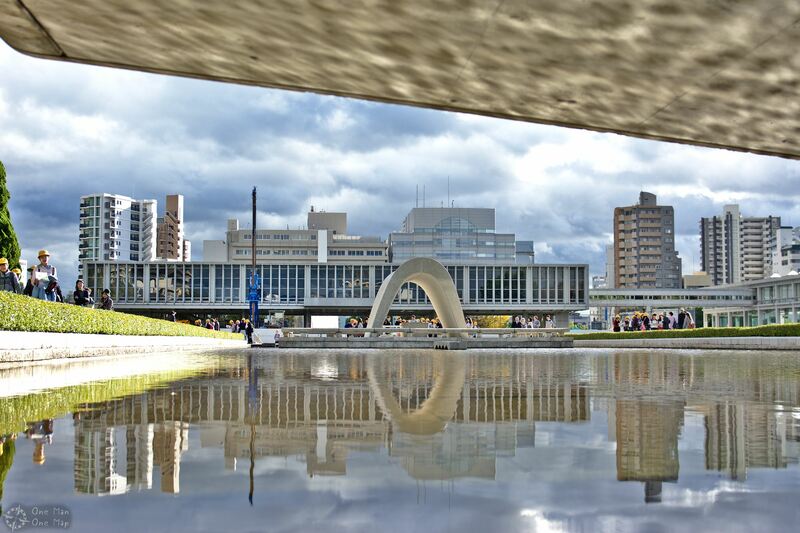 Tourists are often advised not to stay in Hiroshima for more than a day. I especially liked the old, restored tram cars. 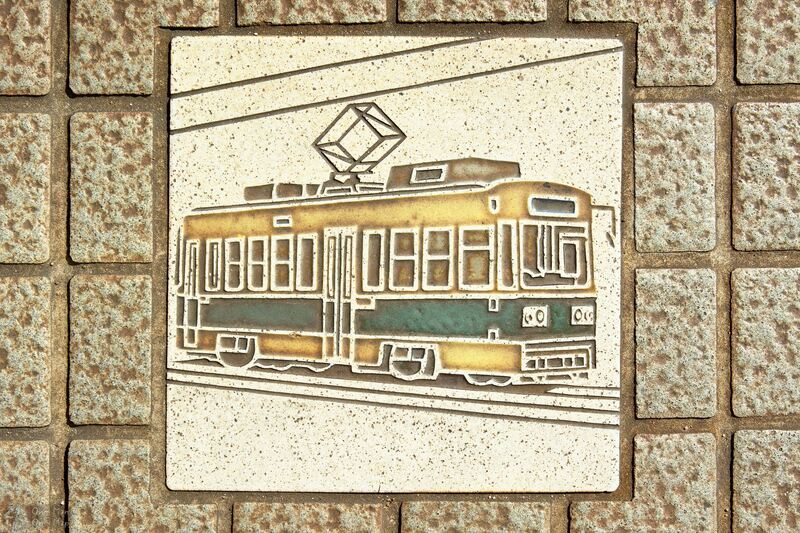 Hiroshima has the largest tram network of all Japanese cities with a track length of 35 kilometers. 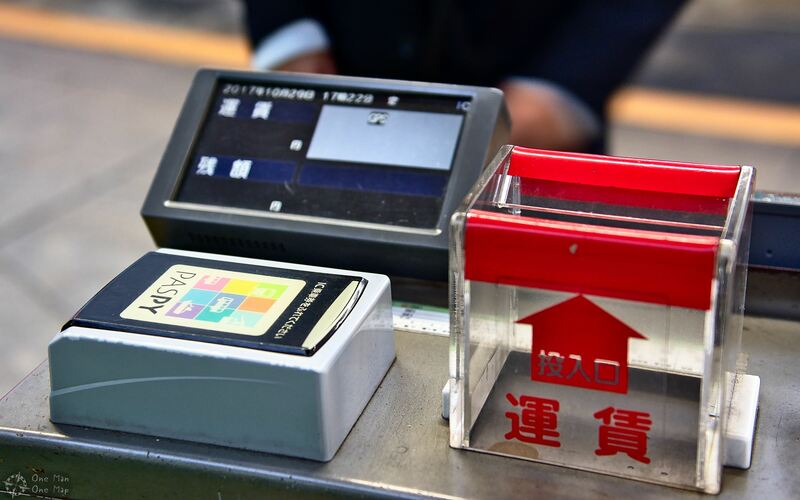 As usual payment was made with a wireless payment card, in this case PASPY (パスピー). 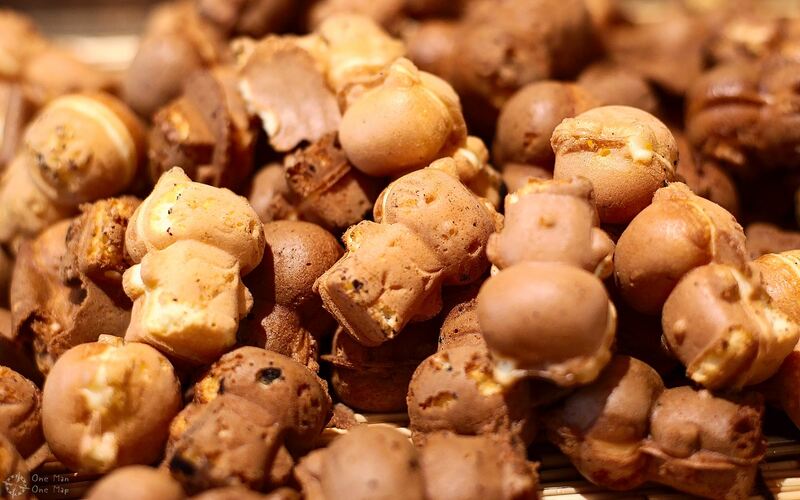 Every year on the 28th and 29th of October Shirakami Shrine (白 神社) holds its autumn festival. 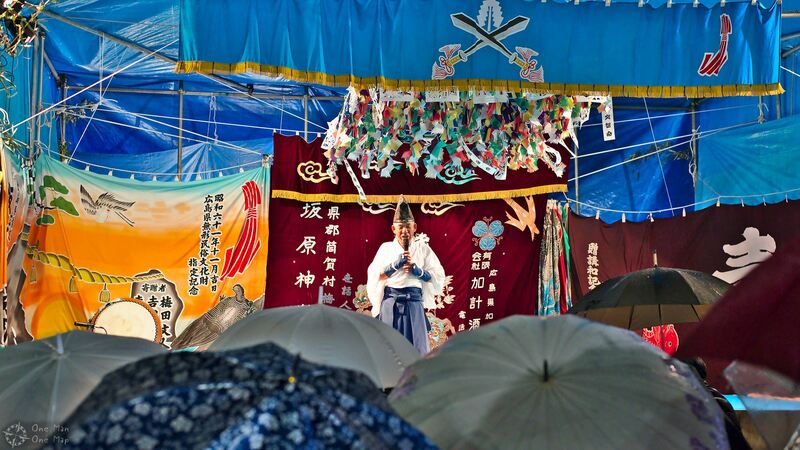 The many events also include Kagura (神楽), performances of ancient Shintō plays and music. 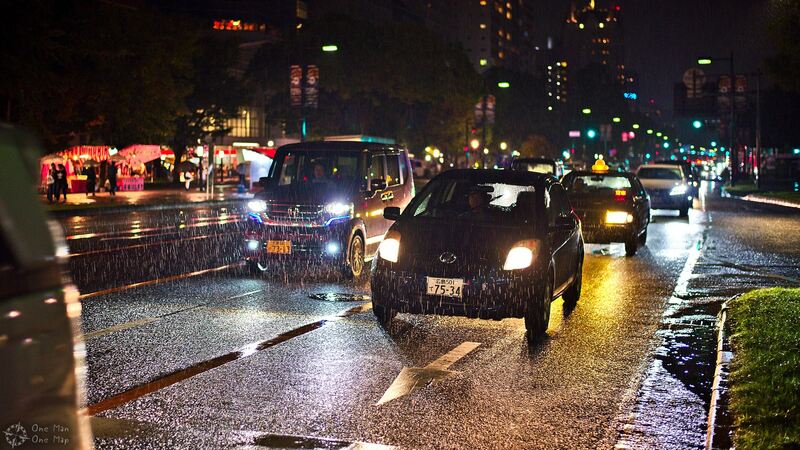 Unfortunately the 2017 festival was affected by heavy rain.